"I know it will take a miracle for these two to work things out." IFC Films has debuted a trailer for an indie drama titled The Journey, telling a fictional account of "an impromptu, detour-filled car ride through the Scottish countryside" where two opposing politicians realize they're more alike than different. 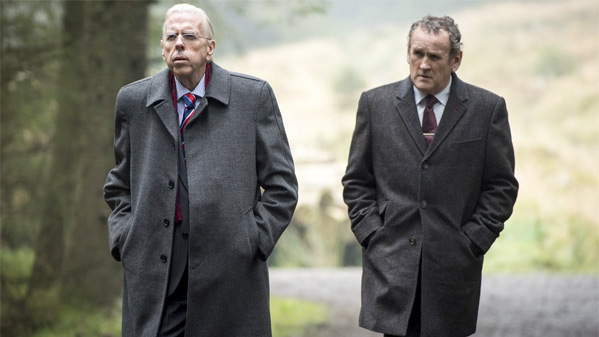 Set in 2006, amidst the ongoing, decades-long conflict in Northern Ireland, Timothy Spall plays the British loyalist Ian Paisley, and Colm Meaney plays former IRA leader Martin McGuinness dedicated to reunification. The cast includes Toby Stephens as Tony Blair, plus Freddie Highmore, Catherine McCormack, Ian Beattie, and John Hurt in one of his final roles. I'm interested in this to see the two different perspectives and what insight each gains from each other, but also for the powerful performances from these fine actors. A fictional account of the extraordinary story of two implacable enemies in Northern Ireland - firebrand Democratic Unionist Party leader Paisley (Timothy Spall) and Sinn Fein politician Martin McGuinness (Colm Meaney) - who are forced to take a short journey together in which they will take the biggest leap of faith and change the course of history. The Journey is directed by award-winning Irish filmmaker Nick Hamm, of the films Talk of Angels, The Hole, Godsend, and Killing Bono previously; as well as episodes of "Full Circle: Chicago Payback" and "Rogue". The screenplay is written by Colin Bateman ("Murphy's Law", "Scúp"). This first premiered at the Venice and Toronto Film Festivals last year. The Journey will first open in UK theaters this June, and also arrives in select US theaters starting June 16th this summer. Thoughts?